Hand made in Israel. 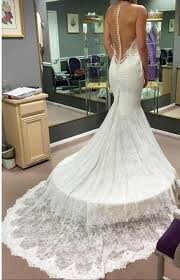 Dress has never been worn or altered. It was delivered to me by mail and I opened it to look at the condition, but never tried on. I do not have photos in the dress, so I used the stock photos from the website. Dress is in perfect condition. I was told you can not alter it to make bigger, but you can alter it to make it smaller. Probably has to do with the illusion sheer material on the back and neckline. I also have a cathedral veil that has never been worn that I could throw in if needed. Everything purchased at Bridal Couture in New Orleans, which is now Town and Country Bridal. I purchased for $10,000, but the store told me it retails for $8,500 today. If you go on their site it’s dress 15-01 of their S/S couture bridal collection. ** I can send pictures of the actual dress hanging if needed.